Researchers from Tokomak Energy in the U.K. are claiming a new milestone in thermonuclear fusion. They were able to achieve plasma temperatures in a fusion reactor, known as the ST40 device, hotter than the sun’s core for the first time — reaching 15 million degrees Celsius (59 million degrees Fahrenheit). 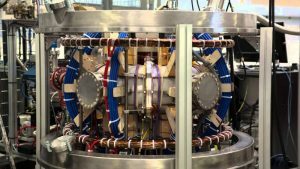 Tokamak Energy researchers at a facility in Oxfordshire are attempting to build an affordable fusion reactor to supply the U.K. grid with fusion power by 2030. Tokamak Energy is a privately funded company. Nuclear fusion is a process that involves the collision of atomic nuclei, which fuse together to form helium atoms. The whole process results in the release of fantastic amounts of energy. This is the same process that powers stars. If we can recreate this process on Earth, we would be able to generate huge amounts of clean energy with no harmful byproducts, such as carbon dioxide emissions or the radioactive waste generated by nuclear fission reactions. Scientists consider this achievement to be a big step. Their ultimate goal, however, is to heat the high-energy gas to 100 million degrees Celsius (212 million degrees Fahrenheit). “We are taking significant steps towards achieving fusion energy, doing so with the agility of a private venture, driven by the goal of achieving something that will have huge benefits worldwide,” said CEO Jonathan Carling.